This installment in the crime serial “Les Vampires” involves hypnotism, cross-dressing, and murder, as well as a hard-to-follow plot that strains credulity while being hard to predict. In other words, it’s a lot like other episodes of the series. 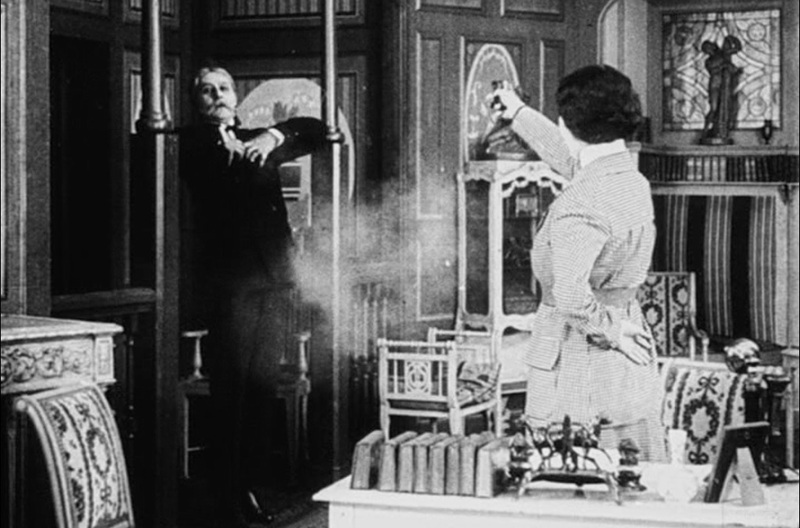 The movie begins by telling us that more than two weeks have passed since the events of “The Corpse’s Escape,” and that a notary has been killed at Fontainebleau. We also learn that Juan-Jose Moréno (Fernand Hermann) is a master of mesmerism, and he now brings his maid into the parlor and hypnotizes her, causing her to go into a deep trance. 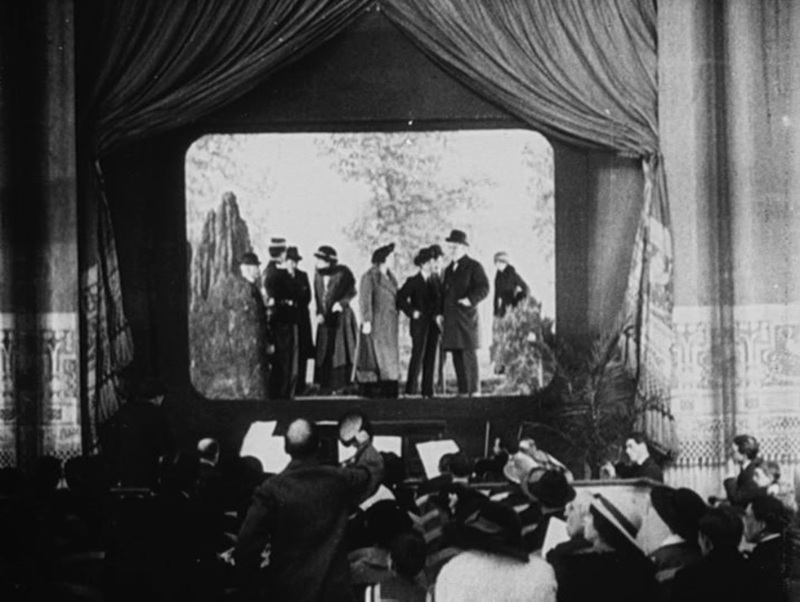 Then, Mazamette (Marcel Levésque) and Guérande (Édouard Mathé) decide to attend the movies. They see a story about the recent murder, and recognize Irma Vep (Musidora) and the Grand Vampire (Jean Aymé) in the footage. Immediately, they rush out of the theater and make plans to go to Fontainebleau. 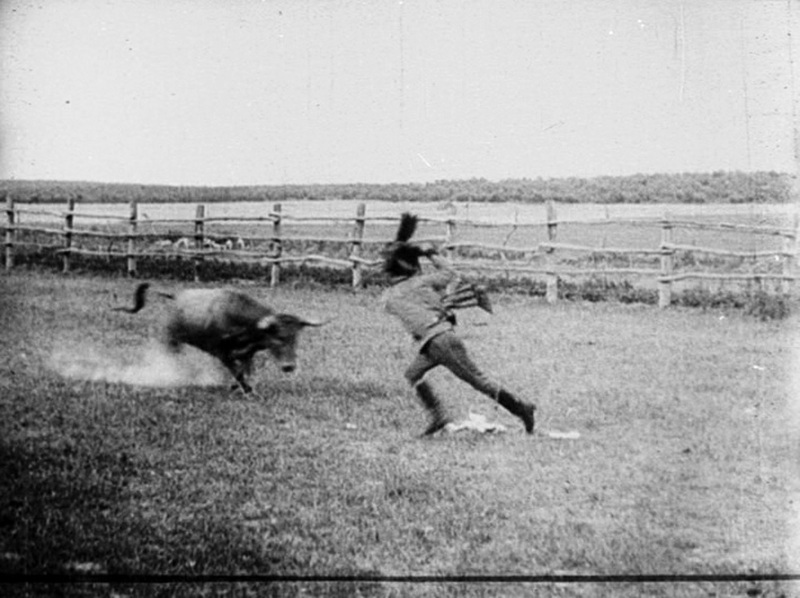 Along the way, they happen to see a visiting American named Warner galloping at high speed on his horse to a remote spot. They follow him and see him hide a box among some boulders, which they recover after he has left. At their hotel, they discover that it is $200,000, which was stolen from an American millionaire named Baldwin, who has posted a considerable reward for its recovery and the capture of Raphael Norton, the man who stole it. They realize that Warner is Norton in disguise. This has nothing to do with the plot. Meanwhile, the Grand Vampire is now disguised as a Count named “Kerlor” and Irma Vep accompanies him as a young (male) Viscount called “Guy.” They also figure out who Warner is (he’s not at all good at keeping secrets) and plan to rob him of the money. Moréno manages to get the room between “Kerlor” and “Warner,” although he has no idea what is going on, and he has brought a very large trunk along with him. The Count tells a rather silly story about a supposed ancestor of his who had to fight two bulls during the Napoleonic Wars (we see the whole thing played out). This somehow distracts the Warners while Irma Vep gets into her Vampire costume and searches Warner’s room until she finds the map. Of course, she is accosted by Moréno, who knocks her out with chloroform and drops her out the window to his gang waiting below. They bundle her into a car and drive off. Meanwhile, Moréno takes his hypnotized maid out of the trunk (!) and disguises her as Irma Vep, then has her give the map to the Grand Vampire in that disguise. The Grand Vampire now swings into action, sending his confederate (Miss Édith) to go find the loot indicated on the map. She gets there and finds instead a note from Guérande, inviting the legitimate owner of the box to meet with him. Then she gets captured by Moréno, who tells her to tell the Grand Vampire that he is holding Irma Vep and will release her for a ransom. She reports all of this to the Grand Vampire, who decides to get out because Guérande might have called the police, but plans to try to recover Irma Vep anyway. In the early morning, the police raid the hotel and find that Warner is actually Norton, so Guérande and Mazamette win the reward. Moréno falls in love with Irma and decides not to return her to the Grand Vampire. Instead, he hypnotizes her and causes her to write a confession of her various crimes, then orders her to kill the Grand Vampire, which she does with dispatch, as soon as he walks in the door. How far would you trust this woman? And now for my usual nit-picky logical questioning of the plot. OK, so Moréno hires a girl who looks sort of vaguely like Irma Vep to be his maid, hypnotises her and carries her into the country in a trunk…so she can wear a mask for a few seconds and give the Grand Vampire something Irma Vep was going to give him anyway? How did he know in advance to have her wear a Vampire costume? How did he manage to get the right room when everyone was using assumed names? How did he know to station his gangsters outside the window with a net just at the moment he was going to push her out the window? And why did we have to watch that silly bullfighting sequence? Anyway, I’m glad Mazamette finally has enough money to send all his children through school. 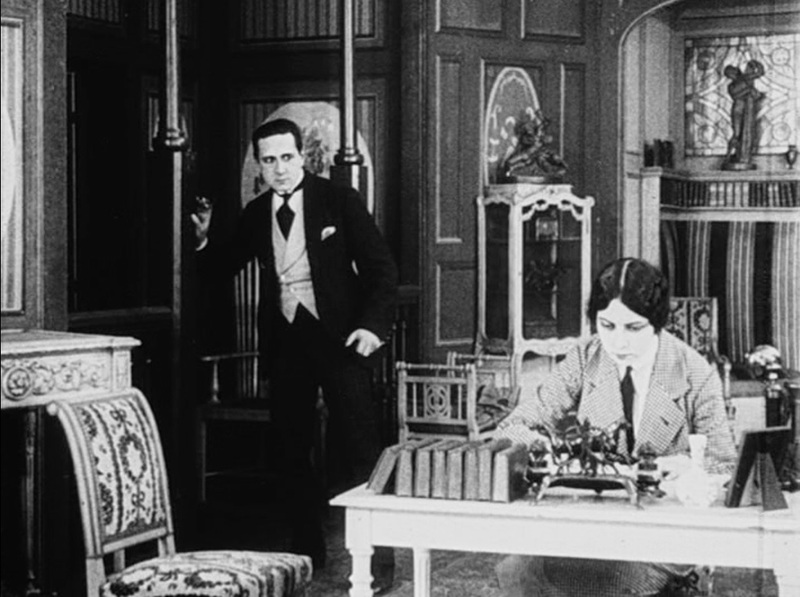 Hopefully the adventures of Musidora and Moréno will continue to thrill us next week. Other earlier Lovecraft film titles include EDGAR ALLAN POE’S THE HAUNTED PALACE, with the plot mostly based on his short novel “The Case of Charles Dexter Ward”, DIE, MONSTER DIE!, based on “The Colour Out of Space”, and THE SHUTTERED ROOM based on the Lovecraft/Derleth story. Another film I think was heavily influenced by Lovecraft was THE CURSE OF THE DEMON, although I cannot find any other mention of this by anyone else. The other above films were from the 60’s, yet CURSE came from the year 1957. I am familiar with all of those movies, though I’m not sure why the comment is turning up here. “Curse of the Demon” was based on “Casting of the Runes” by M.R. James, not Lovecraft.